Our Flagship Series represent the very finest varietal selections from each vintage. With a strong commitment to the philosophy of ‘quality without compromise’, Two Hands Wines use a strict classification process to ensure that only the best barrels each vintage are deemed worthy of being bottled as a Two Hands product. Six months after vintage, every barrel in the winery is blind tasted by Proprietor Michael Twelftree and Winemaker Ben Perkins and given a classification grade associated with its place in the Two Hands portfolio: from A+ to D (and anything C or below not used in Two Hands final production). With this focus on detail, it means only the best barrels make it through and quality is maintained even in the toughest vintages, albeit at lower quantities. Each year, only a handful of barrels come in at the top of the class, scoring an A+; these barrels become wines in our Flagship Series. Serious wines that represent the very finest varietal selections from each vintage. Shiraz is at the heart of the Two Hands story and our vineyard selections give us access to some of the greatest parcels of Shiraz grapes in the country. Each year, every one of the 1,500 barrels of Shiraz is tasted in the search for the very finest cuvée to represent Ares, the pinnacle of our Shiraz production. The handful of barrels that make it through are matured for 24 months in new and one-year-old French oak, and retasted again and again to ensure only the best make the final blend. A statuesque, powerful and deeply flavoured wine that combines elegance and vivacity. A recent addition to the range, Adrestia is sourced from exceptional Adelaide Hills Semillon and Sauvignon Blanc. 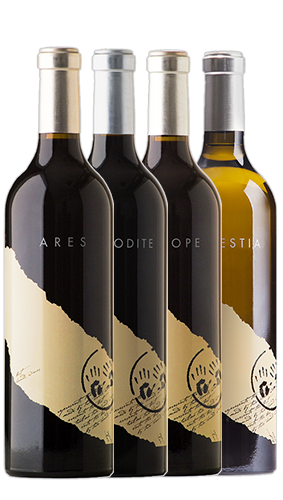 Starting out as a trial in the cellar, Adrestia turned out to be a wine of texture and balance that fully merited the introduction of a white wine to the Flagship Series. Bordeaux in style and released after three years of maturation in oak and stainless steel barrels, this intriguing white is complex and layered with a creamy palate of nougat and fresh straw.